"We workers are also for the freedom of Ukraine, but we want Soviet power." Early Soviet cinema is rather an odd duck in more ways than one. On the one hand, there was extraordinary freedom and brilliance of technique. At the same time, the slavish adherence to ideological standards seems diametrically opposed to the liberties taken in the technical sphere. Director Alexander Dovzhenko here takes the montage techniques perfected by Eisenstein in Battleship Potemkin (1925) and carries them to the next logical step, while also putting a human face on his tale of revolution in the Ukraine. In late 1917, the Russian troops are in disarray before the German foes, as chemical warfare leaves a string of disfigured corpses. The troops, demoralized to an extreme, desert and head back home to Ukraine. The film gradually focuses on Timosh (Semyon Svashenko), one of the soldiers, and his acceptance of Bolshevism. But the workers of Kiev are under assault by the anti-revolutionary RADA troops, and the Bolsheviks seize the local arsenal in defiance as they seek to initiate a workers' society. What is compelling about Dovzhenko's film is not so much the story (based on an actual incident), which is pretty standard issue Soviet propaganda fare, but the way that he tells it. Very little is left to the spoken word (through intertitles; the film is silent). Instead, nearly the entire picture is shot in montage, using juxtaposition to tell the story and make connections. This is far beyond what Eisenstein had attempted, and on its own terms is fairly successful. There are some problems, however, in that to a very great extent it relies upon knowledge of Ukrainian history and politics that the average viewer will not have; for any serious appreciation of the film the commentary is an absolute necessity to persons not already well-versed in the past of the Ukraine. Dovzhenko does significantly depart from the usual Soviet style, however, by putting his focus on Timosh, rather than the collective. This provides a more humanizing feel to the work and gives it a clarity of focus that is sometimes lacking in such pictures. "The workers," like it or not, are rather too amorphous to make for good cinema, and Dovzhenko seems to realize this and uses Timosh to put an identifiable face on the crowd. At the same time, he feels free to use anonymous characters to make a point, such as the mother suffering under privations during the war and driven to beating her own children. Dovzhenko displays familiarity with Griffith by co-opting that director's trademark "race to the rescue" sequence, though it's by no means a predictable one. The editing is very fine and often quite striking; a train wreck is implied by a jump cut to an accordion flying through the air. Throughout, very little violence is ever shown onscreen. A man will raise a gun, and a cut will reveal another man lying dead on the ground. This is particularly effective during the Great War sequence, when a German officer kills one of his own men for showing sympathy for the deserting Russians. There is plenty of intriguing camera work, such as Dutch angles that distort the viewer's perspective abruptly. Dovzhenko, a former cartoonist often employs a form of caricature, particularly in the sequences involving the bourgeois congress of Ukraine. 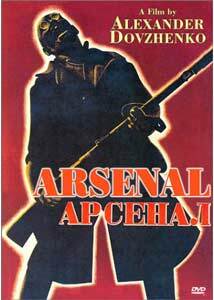 Despite a fair dose of propaganda, Arsenal is a striking and important technical achievement that is densely packed with detail and rewards repeated viewings. Image Transfer Review: The black-and-white picture is generally quite good. There is substantial grain and a fair amount of speckling, which is not surprising for a Russian film of this vintage. Grayscale is quite good, with nice intense blacks and whites that are not overly hot. Detail is acceptable though not striking. I was distracted at times by a fairly wobbly frame; it's not clear whether this is a problem with the film itself and how it was shot or a telecine wobble in the transfer process (it looks a bit more like the latter). There is some signficant aliasing on pans downward. Interestingly, the Russian intertitles are windowboxed so that the English subtitles that translate them do not cover them. This is a thoughtful technique for those who read Russian. Audio Transfer Review: The audio is an uncredited 2.0 mono music score that sounds rather antiquated, but doesn't sound quite poor enough to date from 1928. I'm not sure whether it's authentic, but it is dated and carries some crackle and noise with it, which again is par for the course in Russian cinema. The audio is a bit shrill and bright, and there's very little bass to speak of. As a recreation of the soundtrack this is probably more or less accurate, but that doesn't mean that it sounds good. 1 Feature/Episode commentary by film historian Vance Kepley, Jr.
Extras Review: The sole extra is a vital one: a full-length commentary by University of Wisconsin film historian Vance Kepley, Jr. He provides the essential historical background necessary to understand Dovzhenko's visual references; without this guidance I must admit I would have been entirely at sea. He also helps explicate the montages and the matters expressed through montage and technique, while also providing valuable bits of information regarding Dovzhenko's career and his difficulties with Stalin. Few films require a commentary as much as does this one, and Kepley does an outstanding job of making this difficult picture accessible. Chaptering is adequate, but the subtitles are not removable. Montage is taken to an intriguing extreme in this Russian silent, given a decent transfer despite some wobbliness. The commentary is essential and earns the disc a recommendation.